Create an initial project for your source code. Create a new project for each existing project or component in your source code tree. Link the projects to a directory in the source tree. 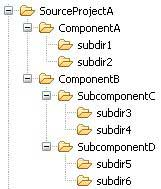 Build the component project in the linked folder. For information about container projects, see "QNX C/C++ container projects".